Like classic cars or your favorite T-shirt, some things just get cooler with age. It's especially true of electric guitars--they develop an unmistakable mojo over time that only makes 'em look even cooler and feel even more comfortable than when they were first bought. 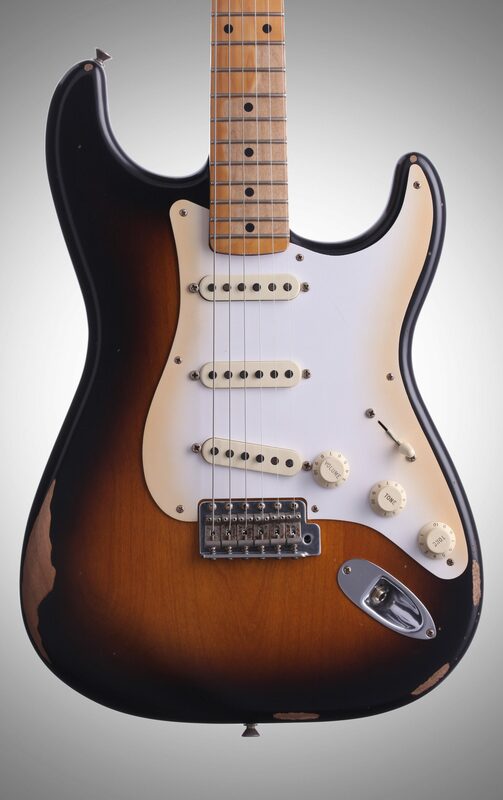 Fender's Road Worn '50s Strat guitar delivers that killer aged look, feel and mojo without breaking the bank; designed using 1950s specs augmented by Tex-Mex pickups and 6105 frets. A true player. 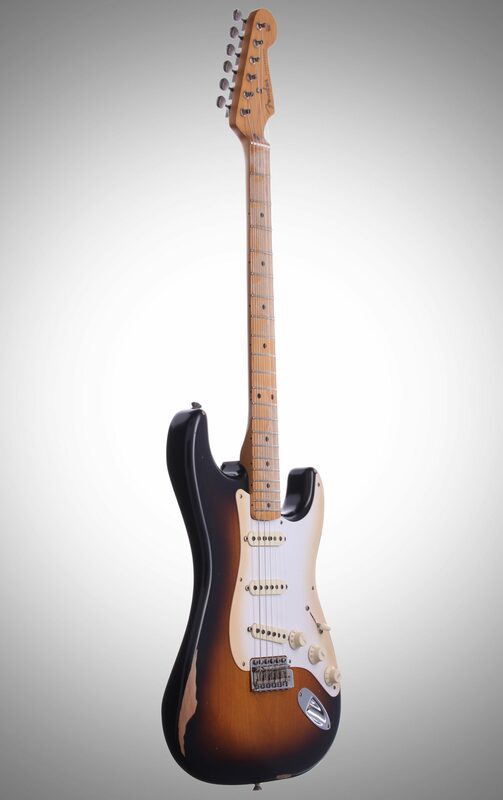 Few things in this world have gotten cooler with age than the Stratocaster. Born in the '50s, they became even cooler after years of use (and abuse) on the road--morphing over time to look appealingly battered and feel even better than when they were first bought. 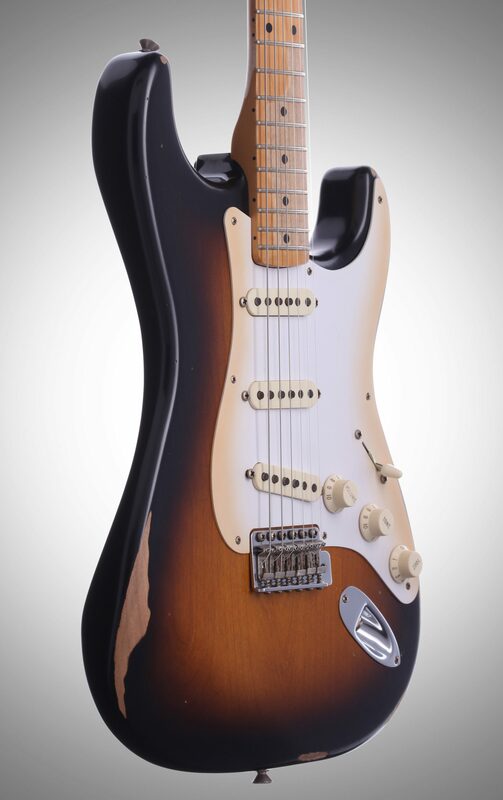 Fender's maple-fretboard Road Worn '50s Strat delivers that aged look and feel -- built to look, sound and feel like it's got more than just a few miles on it, designed with 1950s specs, including a nitrocellulose-lacquer finish, and supercharged with Tex-Mex pickups and 6105 frets. "find the right one and buy it now!" Sound: OK..I don't know what the complainers were smoking, but this guitar is great!! IMHO. The sound is awesome...just like a strat should sound. This one sounded even better than the american standards I tried. I was considering the standard first, but this road worn one just blew it away. I would recommend staying with Fender 250R (10-46) strings. They really give the guitar that Fender strat sound. At first I changed strings to ernie ball slinky 10's, but it wasn't as good. I switched back to the Fender 250R's. Did some recordings going direct into the board...sounded killer. Feature: The guitar comes with a fender deluxe gigbag, polish cloth, allen wrench for saddle height, and a whammy bar with aged white tip. The tex-mex pickups sound great and the neck feels wonderful. The guitar feel comfortable, and not all that shiny new yuckiness. Ease of Use: in my opinion the playability is remarkable, abd again, the guitar has just the right weight and comfortable feel to it... Quality: I found the quality to be excellent, in my case. I have read where the necks are made in the USA but shipped to mexico for assembly onto the guitar (or some such). Everyone should know that most guitars need a little adjustment after purchase. I am a guitar tech and only had to do very minor adjustments for intonation...but that's about it. You have to go to the music stores and try them out...if you come across multiple lemons, then go to another store and try those others. You'll find one that matches your expectations sooner or later. it will be worth the hunt. Value: It's a great value... $899 is really topping out though...but if you can bargain down into the mid700's...that's a little easier to swallow. still cheaper than the american standards, although it seems there was a recent price reduction? anyway, Manufacturer Support: don't know...haven't used it. I would imagine it would be good. The Wow Factor: this guitar (after finding the right one) is really appealing. If you are an experienced guitarist, you will thoroughly enjoy this road worn 50's strat. It will inspire you. Overall: I expect to keep this strat... I have been thru multiple others, Fender and copies... but this one is a keeper. It's my friend already, and i just got it a few weeks ago. 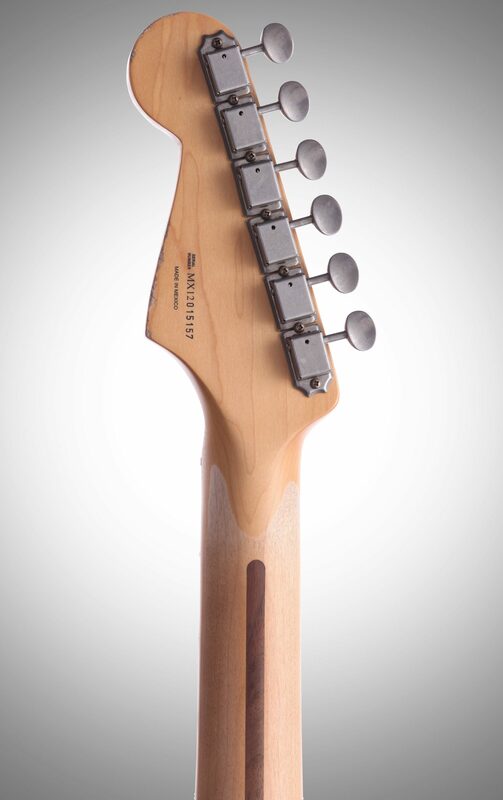 "Best Buying Experience I've Ever Had"
Sound: The pickups are great! Plenty of range and simply sound great in any setting. 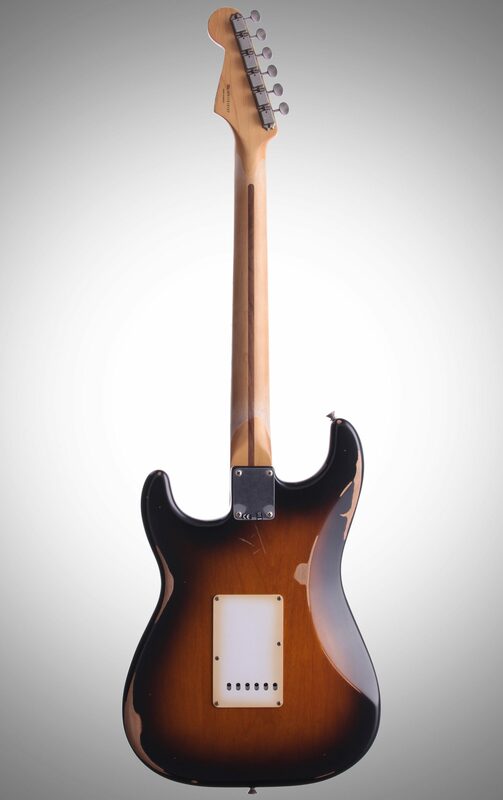 Feature: The "Road Worn" work on this guitar is very interesting. Quite a bit of detail has gone into it. The sanding is first thing you notice but I would say is the least of the detail. Plastic parts are aged and even a bit of rust on the bridge. I believe it will just get better as I add my own wear and tear. Ease of Use: Its a strat - pretty straight forward. Neck is different for me but I think I will grow to love it. Quality: Solid quality build. I was a bit skeptical about purchasing a Mexican made guitar so didn't set my sights to high. This guitar exceeds my expectations and is of obvious good build quality. Value: Worth every penny not more. Its a fair deal in my opinion but not a great value. $899.99 is top of the range for this guitar. Manufacturer Support: No need to contact manufacturer yet. 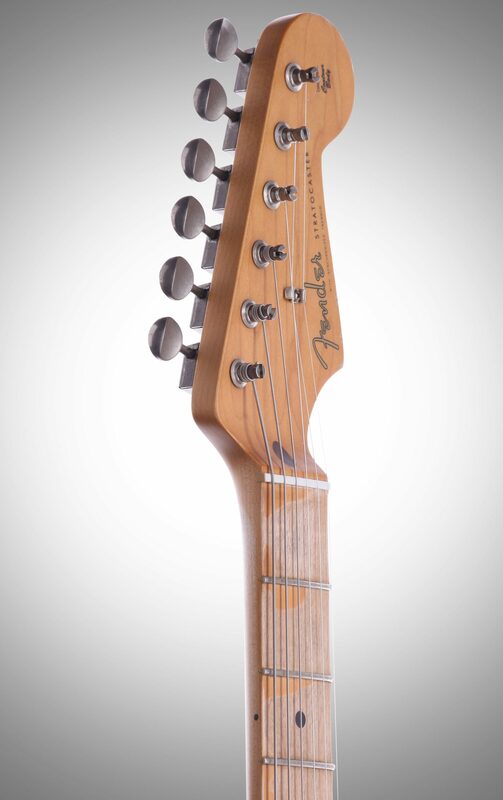 It's Fender so I expect customer service to be good. The Wow Factor: It's a little work of art. It's cool to know that probably several people personally put this guitar together and took the time to create the "Road Worn" look and feel. 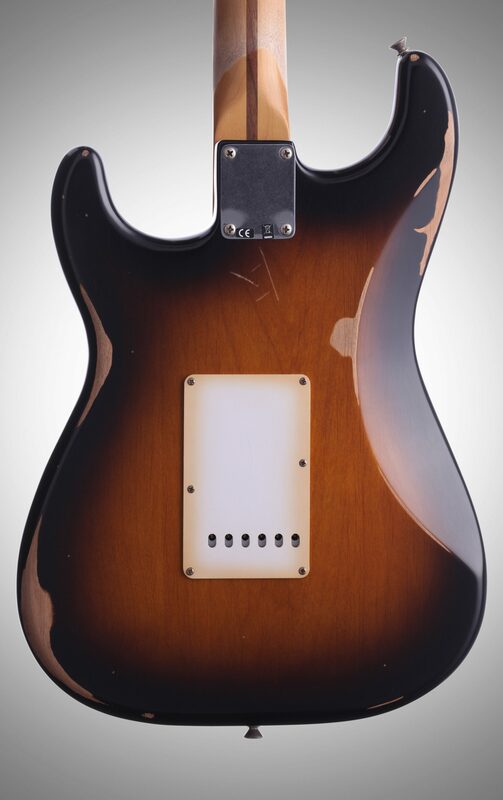 I love it Overall: zZounds made it so incredibly easy for me to order and receive my strat. I have ordered from all of the major online retailers but zZounds have been hands down the best experience. 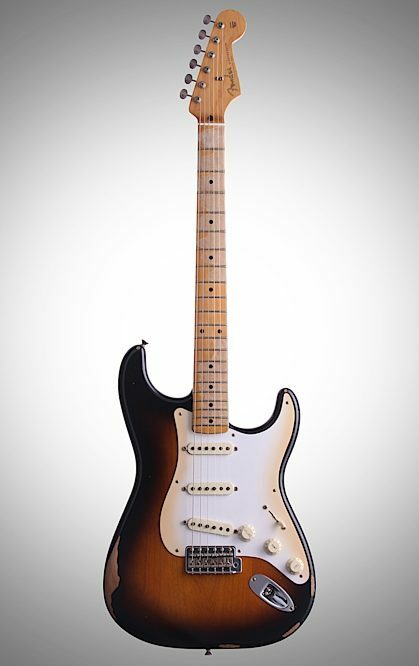 Ordering was easy, they broke my order into equal payments and 2 days later I received my strat. I have called twice for quick questions and a representative has picked up immediately and knew who I was from my phone number. No being put on hold, no hundred questions to answer just to ask one important question. My 50s Road Worn Strat showed up just as advertised. Packaged well and ready to go!